The AmScope SM-1TSZZ-144S-10M digital professional stereo zoom microscope has interchangeable pairs of 10x and 20x super-widefield high-eyepoint eyepieces, a 0.7x-4.5x zoom objective, two Barlow lenses, and a pillar stand. The microscope has an overall magnification range of 3.5x-180x. The 10MP camera has a CMOS color sensor, a reduction lens, image capture and editing software, and USB 2.0 output to capture or display still or video images on a computer or projector. The trinocular viewing head has an interpupillary range of 55 to 75mm, a 45-degree inclination to reduce eye and neck strain, and 360-degree rotation to enable sharing. The vertical trinocular port can be used as a C-Mount or 23mm photo port. The WH10x20mm and WH20x10mm super-widefield high-eyepoint eyepieces combine with the 0.7x-4.5x zoom objective to provide zoom magnification and a longer working distance for inspecting large-scale specimens that require handling or repair. The microscope comes with 0.5x and 2.0x Barlow lenses that can be added to the objective to increase the magnification range. A Barlow lens with a magnification of less than 1.0 reduces magnification and increases the working distance, while a Barlow lens with a magnification greater than 1.0 increases the magnification and reduces the working distance. High-eyepoint eyepieces ease viewing for users who wear glasses, and dioptric adjustment accommodates individual eye-strength differences. 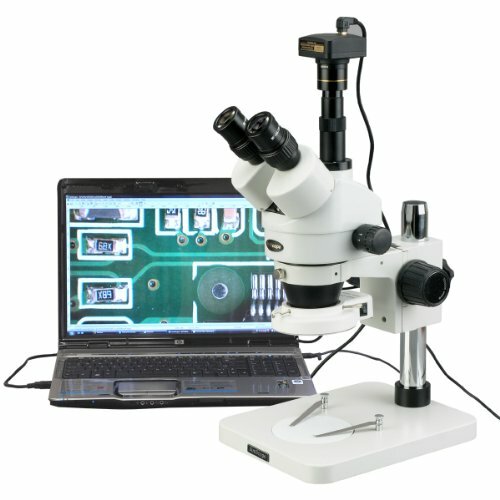 A digital stereo microscope, sometimes called an inspection or dissection microscope, has low magnification and a long working distance that enables users to manipulate the object being inspected, and is used where image capture, detailed records, or documentation is required. The 10MP digital camera has a CMOS color sensor for displaying still microscopy images and streaming live videos to a computer or projector. The camera has 40x magnification and a 0.5x reduction lens that ensures that the display has a similar field of view as the microscope eyepiece. The camera can be mounted in a C-Mount or any 23mm eye tube. The camera includes image capture and editing software that provides still image and live video capture and editing capability, including measurement functions. The software supports JPG, TIF, GIF, PSD, WMF, and BMP file formats and is compatible with Windows XP/Vista/7/8/10 and Mac OS X. Camera drivers are compatible with Windows XP/Vista/7/8/10 and Mac OS X. The software includes Windows APIs for native C/C++, C#, DirectShow, Twain, and LabVIEW that enable custom application development. The camera has a USB 2.0 data port (cable included). The removable 144-bulb LED ring light provides bright, cool light for working with temperature-sensitive or live specimens. The ring light provides shadow-free illumination, and a rheostat controls the amount of light emanating from the lamp. Power and adjustment controls are located on the light head. The ring has a 2.4" (61mm) inside diameter and a 4" (100mm) outside diameter. It has a 100,000-hour life span and a 110V-240V variable power supply. The table stand has a reversible black and white stage plate that provides contrast with light- and dark-colored specimens, and stage clips to secure the specimen in place. The stage plate has a 3-3/4" diameter (95mm). The stand is 10 x 7-7/8 x 10-3/4 inches/254 x 200 x 275mm (H x W x D, where H is height, the vertical distance from the lowest to highest point; W is width, the horizontal distance from left to right; D is depth, the horizontal distance from front to back). Field of view range 2-1/2"
Includes 10MP camera, redution lens, USB 2.0 and software for capturing or displaying images. Compatible with Windows XP/Vista/7/8/10 and Mac OS X.